MARK NANCE/Sun-Gazette Members of the Peachtree, Ga., Little League team sit outside of their dugout prior to a game at the Little League World Series against Honolulu, Hawaii at Howard J. Lamade Stadium. Columbus, Georgia captured the 2006 Little League World Series championship. Warner Robins, Georgia won it a year later. 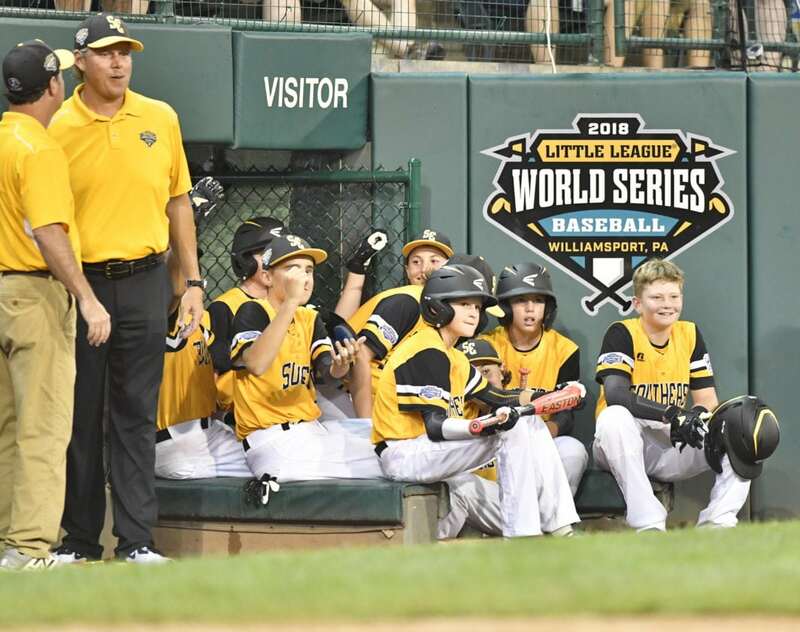 The two Little Leagues competed at the Little League World Series five times from 2006-11. Just imagine being the other Georgia teams that had to compete against those powerhouses back then. Some of the world’s best teams could not beat Columbus or Warner Robins and they often ran roughshod over their state’s other teams. It seemed like this dual-monarchy would continue growing stronger as the current decade continued. Then Peachtree City American Little League came along. Actually, PCLL had been around for a long time, but until 2015 it seemed like just another league compared to the two Georgia giants. That all changed in 2015. Peachtree City broke through and captured the state championship. It has grabbed a stranglehold since then, winning four straight state titles. Now the world is learning just how Peachtree City has become so good as it competes for the first time at the Little League World Series. That is a recipe that has worked since 2015. Peachtree City won a game in its first Southeast Regional experience that year before reaching the championship the past two seasons. It achieved the ultimate breakthrough this year, going 4-0 at regionals and capturing that elusive championship. Ironically, Peachtree City won that championship in Warner Robins. It was the success of programs like Warner Robins and Columbus that helped Peachtree becoming stronger and change its approach. For years, most athletes played either Little League or travel baseball. Rarely did those players cross over. Basically, the city’s best players were split up. To make a run at the state’s behemoths they had to come together. That started happening as the decade continued. Instead of choosing between Little League and travel, athletes are playing both now. Together, they are showing how good the quality of baseball being played in Peachtree City really is. Peachtree City has grown stronger each year and nearly reached the Series last season, dropping an 8-6 heartbreaker to eventual U.S. finalist Greenville, North Carolina. This season, Peachtree went 4-0 at regionals and entered the Series undefeated this summer. It made a huge statement at states when it outscored four teams, 40-5. Included in that field were Columbus and Warner Robins. Peachtree City blanked Columbus both times it played, handing it its only defeats this summer. There was a time when Columbus and Warner Robins stomped opponents at states, winning nine straight championships. While Peachtree City has won four straight state championships, other teams also are making their presence felt. Smyrna eliminated Warner Robins, pushed Columbus hard and finished third. Cartersville had a good run and both teams were among the best Peachtree said it had seen through regionals. Peachtree might have taken over, but it also has given other teams and leagues a psychological boost. The competition is making the entire state better. Warner Robins and Columbus pushed Peachtree City. Now Peachtree City is pushing the other programs who are making strides. Survive the Georgia state tournament and one has a solid shot of reaching the Little League World Series. The thing is, Peachtree City could just be getting started. Reaching the Series can only help the league’s future as younger players will be eager to follow in this team’s footsteps. Enrollment also likely will increase and this hard-working team has provided a blue print for what it takes. Peachtree City is a relatively small community but it shares a close bond.